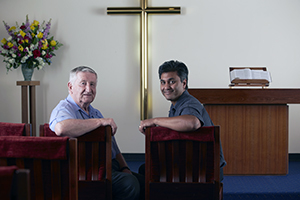 The Fremantle Hospital chaplaincy and pastoral care service provides spiritual and emotional support to patients, relatives and staff. The service is offered to all people regardless of whether they have a religious affiliation. The resident chaplain and assistant chaplain are both Anglican and on-call 24 hours a day, seven days a week. A Catholic priest is also available on-call. Representatives from other faiths and religions can be contacted on request. The hospital chapel is located in B Block, Level 4 and provides a place of a peace and quiet prayer and reflection. The chapel hosts a Roman Catholic Mass each Sunday at 11.15am, all are welcome to attend. Anglican bedside communions are available on request. The chaplaincy team is committed to supporting your spiritual welfare during your stay in hospital. We aim to help you make sense of your experiences through our ministry of presence and care, and by listening to your story. We also offer support through the sacraments of the church, including prayer, blessing, holy communion and anointing. Although we are Christian, you can request a representative of any faith or religion. Above all, we seek to be of service to you and your family in your time of need.